Mom, the Intern: Lady Liberty is weeping. America is sick. She's laying in a hospital bed, hooked up to machines and heavily sedated. The doctors don't know if she's going to make it. The prognosis isn't good. I am sitting at her bedside, holding her hand and imagining the unthinkable -- life without our beautiful nation as we know her. Only 240 years old, she's a young country. Too young to die. The world needs her. We need her. She's been ailing for a long time now, riddled with continual infections of selfishness, pride and hatred. But she began a sharp downward spiral earlier this year with the Republican nomination of Donald Trump -- a narcissistic, lying bully who wants to disable free trade and abolish liberty. He's a man of conflict who, in addition to being racist and quick to anger, has no clue what he's doing. Yet, he's running for President, and he's garnered way more support with his sharp-tongued rhetoric than anyone thought possible. Then, the Democrats nominated Hillary Clinton, a woman known for talking out of both sides of her mouth, a proven liar who will say anything to get elected. Another narcissistic, incompetent bully whose motivations are self-serving. A snake in the grass. But, America took a turn for the worse this week. It began when Clinton got off with a mere slap on the wrist for actions just short of espionage. Her negligence and selfishness could very well have cost America her security, endangering lives in the process. Top secret and classified intelligence likely leaked out to our enemies in thousands of e-mails, all because she didn't feel like using her federal, SECURE e-mail account for official matters. Meanwhile, the FBI director stated that although Clinton's actions were "extremely careless," they didn't warrant prosecution. Never mind that the law clearly states the opposite. Her power and wealth saved her. And yet, like Donald Trump, she's won the support of nearly half of Americans. The Clinton e-mail scandal had me all up in arms, ready to blog my fingers off. But then, within a day of each other, two black men were shot at point-blank range by police, and both incidents were caught on video. Those Clinton e-mails faded fast from my mind because human life always takes precedence. I must admit, prior to this week, I was mildly concerned with police overreach and acknowledged a possible undertone of racism in connection with police shootings. But, like many others, I said, "Let the law decide if the officers were justified in shooting the suspects." I washed my hands of it, basically. And why wouldn't I? I'm a white woman with no dog in the fight. However, after I watched those videos, I realized I actually have a duty to be upset in situations like this. Like those men who were shot and killed, I am a citizen of the United States. Their liberty is my liberty. And when their rights are in jeopardy, so are mine and so are yours. When people in power have too much control, we all suffer. Those men will never know justice. They can't defend themselves in a trial of law. They're dead. Their sentences have already been carried out. I watched America, gasping for air and clutching her chest, not knowing how she could survive much longer, when she coded. Last night, at a peaceful protest against police violence in Dallas, snipers shot and killed five police officers. Officers who loved their community, who put on their uniforms knowing it carried the risk of death. They were there to protect those protestors so they could exercise their right of free speech in a safe manner. They were just doing their job. They were innocent. They didn't deserve to die. Why is America so sick? It's because the hearts of her people are hard and cold. They have given up on "liberty and justice for all" and instead, they only pursue it for themselves. They're prideful, selfish, impatient and unkind, and they exemplify these characteristics through violence. Your wretched refuse from your teeming shore. Send these, the homeless, tempest-tost to me." Liberty is for all, but it's our responsibility to allow it to prevail. It takes work and it takes unselfishness. We encourage and grow freedom by helping others and allowing them to choose for themselves. When we act against each other in violence and aggression, forcing one another to bend to our will, we smother our collective freedom. We communicate to those in power that we can't be trusted to choose righteousness on our own and we need them to tell us what to do. 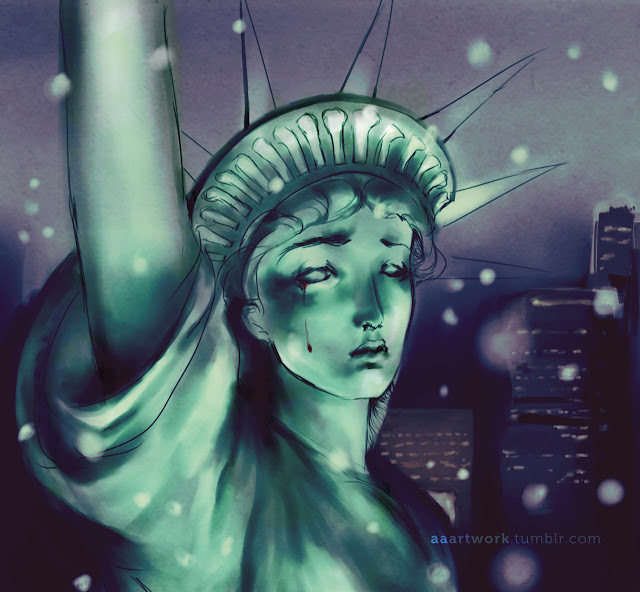 Lady Liberty is weeping over America today. God is weeping, too. And I am weeping with them.